On this date in 1936, Kentucky native George W. Barrett was hanged in Lockport, Indiana. Two juries were unable to reach a verdict. Minor detail: Barrett’s cousin, Frank Baker, was the prosecutor in that case, and observers noted he appeared rather less than zealous about convicting his relative; the judge even remarked that Baker sounded more like Barrett’s defense attorney. After his 1931 murder trial, a decidedly ungrateful Barrett allegedly murdered Frank Baker. At his 1933 trial in that case he got a hung jury again, in spite of the fact that the only relative of his involved in the trial was the victim. FBI agent Nelson Klein: shot dead in Ohio, but his killer hanged in Indiana. Third time’s the charm: Barrett finally got his just deserts on December 7, 1935, when he was convicted of murdering FBI Agent Nelson B. Klein. The jurors stayed out for two days, but supposedly they decided on his guilt long before then and only wanted a few more free meals. 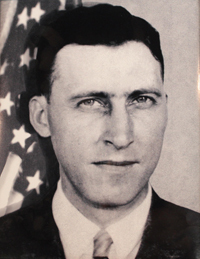 Barrett had killed Agent Klein in a shootout on August 14, 1935; before dying, Klein shot back, hitting Barrett in the legs and crippling him. The other agent involved in the gunfight, Donald McGovern, was unscathed and arrested Barrett. There was an interesting dispute as to which state had jurisdiction over the crime; the agents had been standing in College Corner, Ohio, but the killer fired his shots from a position 22 feet over the Indiana state line. In the end, Indiana got the honors. A recent federal law had mandated the death sentence for anyone convicted of killing an FBI agent. Barrett was the first to die under the new law; another man who’d murdered two agents in 1934 got a life sentence in Alcatraz. The leg wounds Barrett suffered in his last shootout never healed. He attended his trial in a wheelchair and ultimately had to be carried to the gallows.